The Elements Of Magick. Each of the elements is necessary for human life. All have both positive and negative aspects, and each acts as a check for the others. Each of these creative elements are necessary for human life, the each have both positive and negative aspects The Earth without Water to moisten it, without Fire to warm it, and without Air to surround it, would be a lifeless planet. The elements work in harmony, even though at times their contrary aspects may seem in conflict with each other, to create and to sustain life. 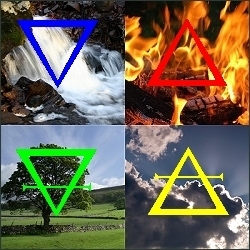 The elements exist in a physical form, such as a handful of soil, and in an unmanifested, non-physical form or energy. All the elements emerge from Akasha, the source of all energy. Water is the cleansing, healing, psychic, loving element. It washes over us when we see our mates; supports us when we swim; gives us life when we are dehydrated. Air is vital to human survival. Without air, we would perish. Air is the power of movement; of freshening and of intelligence. In magickal terms, Air is also the power of the mind: the force of intellect. The Seven Noble Metals Of The Ancients and their associations with magick. These metals and the planetary and astrological correspondences are important in many aspects of Witchcraft. The four elements of material creation are surmounted by the fifth Element Of Spirit, the element that links us to the divine. Fire is the creator and destroyer. It warms our homes, cooks our food, and fuels our passions. Unlike the other elements, Fire cannot exist in physical form without consuming something else. Akasha is the fifth element, the binding part that runs through all matter, and it is also the collective unconscious of life-forms. The word itself is Persian/East Indian and means 'inner space'.